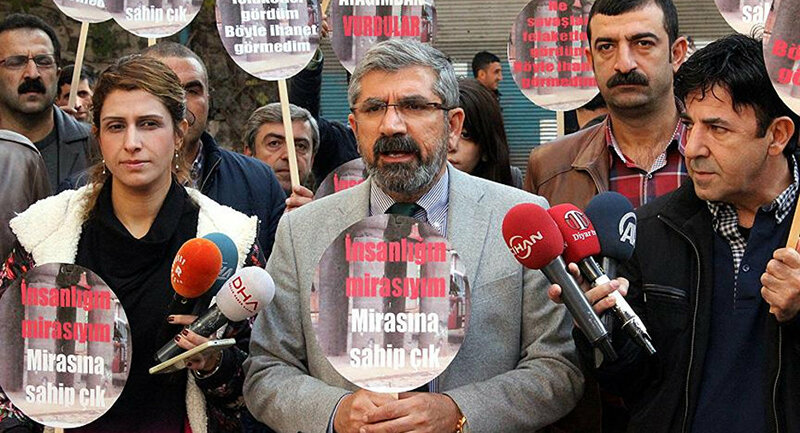 A new report examining the weapon that led to the death of Tahir Elçi and which may have been used by him was released by Diyarbakır Bar Association on Friday. Tahir Elçi, Diyarbakır Bar Association Chairman, prominent pro-Kurdish lawyer and rights activist was shot dead in Sur district of Diyarbakir, south-eastern Turkey in November, 2015 while he had been making a statement calling for an end to violence between the Turkish state and the Kurdistan Workers’ Party (PKK). In order to determine and shed light on the moment, in which Elçi was shot, killed and find the suspects, Diyarbakır Bar had demanded to carry out a technical investigation from London-based international investigation company Forensic Architecture. According to the BBC Turkish news, in the Forensic Architecture’s report, which was made public in a press speech of Diyarbakır Bar Association, Elçi might have been shot and killed by a bullet from one of the three police officers at the crime scene. Elci was born in 1966 in Cizre. He was working to help end the decades-long conflict between the Kurdistan Workers’ Party (PKK) and the Turkish state. He was killed at a press conference on November 28, 2015, while appealing for de-escalation in Diyarbakir. The government blamed the PKK and its affiliates for his death. The report did not rule out the possibility of Elci dying of crossfire between the police and the PKK. Regarding the report, lawyer Barış Yavuz made a speech to BBC Türkçe (Turkish) and said that the cartridge of the bullet, which killed Elçi has not been found yet. The exact time of Elçi’s death has not been determined yet as well. All cameras were turned to the two running PKK members. In order to determine the closest moment of the killing, Forensic Architecture prepared a 3D model by uniting audios, the physical structure of this place. The non-profit organisation mandated by Goldsmith’s research group to use computer-generated imagery (CGI) to provide the most comprehensive, multi-dimensional investigation of the events as they played out. Four different cameras which had recorded the event was synchronised, then, the time gap during which Elçi was killed, the latest frame on which Elçi was seen as standing position, the first frame on which Elçi lying on the ground, and latest shooting sounds were shortened to the nine second time gap. Some 40-gun fires which shoot in this nine min long time gap was also placed a single time chart. By using architectural plans and satellite images, a 3D model of the crime scene was created. According to the report prepared by Forensic Architecture, “police officers C and D can clearly be seen firing in the direction of Elci, and should be considered suspects in his killing,” stated the report. “According to our analysis, one of these two officers likely fired the fatal shot that killed Tahir Elci,” the report added. “Seconds before, police officer A also had a line of fire towards Elci, though partly obstructed and at a greater distance. He should also be considered and questioned as a suspect,” the report mentioned. “It is quite possible that the killing was an unintentional consequence of the firefight. However, the fashion of it unfolded, and Elci’s place within the long history of conflict in that region, make it inevitable that questions and suspicions will always surround the incident,” it stated. Meanwhile, the report declined a number of claims such as the police using blanks or Elci being killed by long-range weapons such as rifles carried by the PKK. This process of elimination suggested that “one of the police officers who fired their weapons during the incident could have been responsible for the fatal shot,” the report stated. Forensic Architecture Director Eyal Weisman made a speech to BBC Turkish following report. “We can only speak what on what we have seen. We are seeing the firing gun. We don’t want to make speculation. In the 3D plan, we see the direction of the gun and we say the bullet possibly shot the Tahir Elçi,” said Weisman. Following the releasing of the report, Diyarbakır Bar Lawyer Barış Yavuz demanded taking the testimonies of three suspected police whom testimony was heard before as a witness. Continuing his speech Yavuz noted that until now all suspects testified as witnesses. Hearing the witness is not enough to push forward the investigation. “For example, if this people will testify as suspects then the communication of the suspects could be determined. According to the HTS records their location, with whom they spoken could be determined. But when they testify as a witness, we cannot reach that information,” added Yavuz. “In order not to allow such actions to happen again, and if happened the necessity to bring perpetrators to justice, and the belief that a fair trial could be established in this land, this is essential that murderers of the Elçi must be captured and brought to justice,” noted Yavuz.